Bill and John Vesper at the Swarthmore CO-OP with their Vesper Brothers Foods’ signature pasta sauce. Let's face it: We of Italian heritage can be extremely fussy about red sauce. And when that "gravy" comes in a jar, we can get downright snobby, if not skeeved. Which makes all the more remarkable the entrepreneurial nerve of John and Bill Vesper, 33-year-old twins from Delaware County, who wanted to "get outside the four walls" of the family deli business — John's Village Market in Wayne, which their father has run for nearly 40 years, and its offshoots in Berwyn and Brookhaven. An all-natural jarred sauce would be their way out, they decided — as long as its taste matched that of their grandmother Rose Vesper's homemade red. Five years since the first batch came off the production line, sauces by Vesper Bros. Foods have moved from modest exposure at the family's delis and local farmers' markets to the coveted shelves of such foodie emporiums as Whole Foods and Wegmans. Yet the order that a profoundly proud John Vesper mentioned before any others in a recent interview was this one: "Can you guys bring us another case of gravy?" The customer? Eighty-two-year-old Rose, of the perpetual pot of homemade sauce (usually with meatballs) on the stove. That is, until her grandsons brought theirs to market. "I don't make that big pot of sauce anymore," she said, without a hint of old-school Italian shame. She even declared her grandsons' sauce better than hers. "Our grandmother was worried we weren't going to sell a thousand jars in two years," said Bill Vesper, referring to the shelf life of their sauce. The inspiration behind Vesper Brothers' "gravy" is their grandmother Rose Vesper, whom the boys call Memom. She is pictured here with Bill, or "Billy" to her. Boy, was "Memom" Rose wrong. Vesper Bros. (www.vesperbrothersfoods.com) is currently selling more than 100,000 jars of its sauces — marinara, arabiatta, tomato basil, and pizza — a year, priced about $6 to $7 for a 24-ounce jar. Online, three-, six- and 12-packs go for nearly $21 to just over $75. Rose Vesper, who lived on the same Wallingford street as her grandsons when they were growing up and taught them how to make pizza and stromboli, remembered her initial reaction to their plans: "I said, 'The shelves are full with different jars of this stuff. It's going to be so hard for you guys.' "
Indeed, the Vesper brothers have encountered many challenges since they set out to become the region's "gravy guys." Their impetus for doing so? They didn't like not working together. After graduating from Delaware County Christian School in 2002, they went to work in their father's deli. A year later, an aunt retired and the young men took over her deli in Berwyn, opening a third John's deli in 2006 in Brookhaven. By then, the brothers had moved out of their parents' house and were sharing an apartment in Media. John worked in the Berwyn deli; Bill, in Brookhaven. "We didn't recognize until we split up how much we missed not being in the same place working together. We've always complemented each other," said John, the older by a minute. In the community football league, he was a quarterback; Bill, a wide receiver and running back. In basketball, John played guard; Bill, forward. In business, Bill is more creative and visionary, while John excels at "getting things done," he said. Making sandwiches day after day, "we got into a rut," Bill said. One evening, watching the Food Network with the woman who would become his wife, he was inspired "to try to make new things and create fresh food in the deli." That led to roast pork, lasagna, and baked ziti, which "sort of snowballed into this idea of making things people could take home that was made in the deli," Bill said. The dishes were a hit in the Brookhaven deli, so they were added in Berwyn. Next came ideas for packaged foods. Given that always-present pot on Memom Rose's stove, sauce seemed the natural place to start. On the internet, they researched what they'd need to cook commercial batches. They bought pressure cookers, mason jars, and their favorite tomatoes, and soon were confronted with the devastating reality that they were able to make only 12 jars of sauce in an hour. Not a feasible business model. "I personally was devastated," Bill recalled. Back to the internet, where they discovered co-packers. The first one they contacted, in Lancaster County, wasn't exactly encouraging, asking, "Do you know there's a lot of people doing this?" His tune changed after tasting their recipe, declaring it "one of the best sauces that ever came through here," as Bill tells it. Then came the deal-breaker: The twins said their sauce must not contain citric acid, a common food preservative and flavor additive. "If it has citric acid, it can't taste homemade," John said. "We were super-adamant about this." The co-packer insisted that any tomato sauce made there had to include citric acid, its tartness needed to temper the tomatoes' sweetness. The brothers walked. If their sauce wasn't going to taste the way they wanted it, "it's not even worth doing," Bill said. In 2011, they found a co-packer from Chester County willing to abide by their recipe. "It was divine intervention," Bill said. On March 21, 2012, Vesper Bros.' sauce was ready for sale: 150 cases, each containing 12 jars and no citric acid. After the daily lunch rush at their delis, the brothers would load cases of sauce into their cars and make cold calls throughout the region. Among the early vendors willing to take product, they said, were Linvilla Orchards and the Swarthmore Co-op. Then, one morning in the summer of 2012, came a meeting with a woman who tried a few spoonfuls of sauce right out of the jar, declaring it "divine." Charlene Nolan is a vegan chef and health educator from Drexel Hill who at the time was a marketing leader at Whole Foods in Devon. "I had never tasted a jarred sauce that was so good," Nolan recalled. She invited the Vespers to set up a stand in the farmers' market her Whole Foods hosted in its parking lot. Within two months, their sauce was for sale inside the store. "That was the ultimate dream," Bill said. 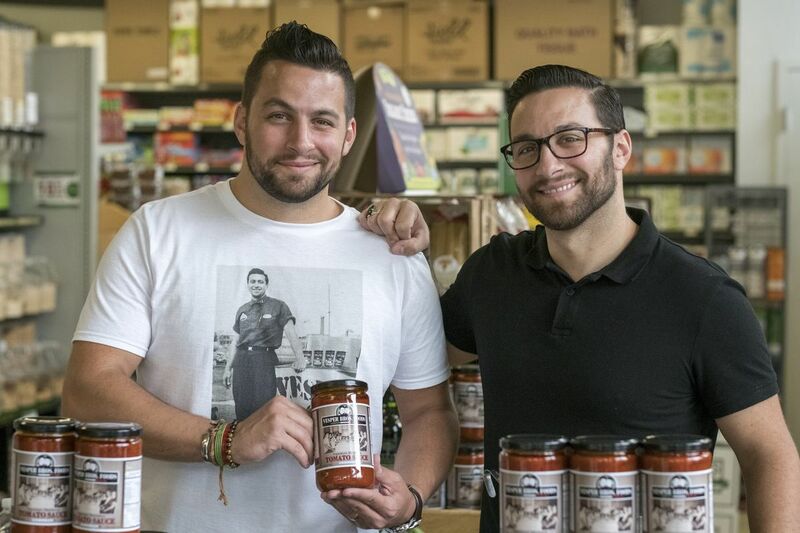 The brothers have closed their delis to devote full-time attention to growing their packaged-foods business, which also carries olive oil, balsamic vinegar, and jarred mushrooms and peppers. They are the only employees, for now, with a plan to extend Vesper Bros.' reach. "We think if we can become a household name in the Philadelphia area, it will be a lot easier to expand to Baltimore, Washington, D.C., New York, out west," Bill said.